Sammay is a Bay Area-based choreographer/producer and interdisciplinary performing artist of Kapampangan, Ilokano, and Bikol descent. She has performed in the works of Jack Gray, Rhodessa Jones, Alleluia Panis and has been featured through Diego Rivera Art Gallery, RAW Artists, and Dance Mission Theater’s D.I.R.T. - Dance In Revolt(ing) Times Festival among others. Sammay has taught throughout the Bay Area and was recently a guest artist through Asian/Pacific/American Institute at NYU where she taught for DANCES WITH WOLVES: Indigenous Contemporary Dance Master Class Series and performed in the first ever Indigenous Dance Forum. Her desire to discover and uncover has also led her to Brazil, Philippines, Cuba, and most recently New Mexico for Dancing Earth Summer Intensive led by Rulan Tangen. Sammay is a two-time recipient of the "Presented by APICC" Artist Award which has enabled her to produce, choreograph, and curate for URBAN x INDIGENOUS at SOMArts Bay Gallery. Recently, she took part in the inaugural cohort of the CrossOver Collaborative Residency at Red Poppy Art House curated by Zena Carlota Pearl and Amara Tabor-Smith. Sammay is the Featured Artist for APAture 2016: Here and Performing Diaspora Artist-in-Residence at CounterPulse where she will be presenting new work this December. To follow her journey, visit www.sammaydizon.com. Based on the Zoot Suit Riots of 1943, Pachuquismo explores early chicano/a identity and experience as Pachuco/as who uniquely embraced the jazz scene through live vocals, percussion, Mexican zapateado, and rhythm tap. La Mezcla, formed in 2013, is a multi-disciplinary rhythmic collaboration that explores cultural identity and social awareness. Founded by Vanessa Sanchez, a San Francisco based Dancer, Educator, and Choreographer, La Mezcla produces work that is culturally rooted in Mexican/Chicano traditions while connecting the past to the present through rhythm and movement. Past work has been presented in CubaCaribe and D.I.R.T. Festival. Conceived and directed by artistic director Deborah Vaughan, The Town on Notice began in early rehearsals and workshops in 2014. 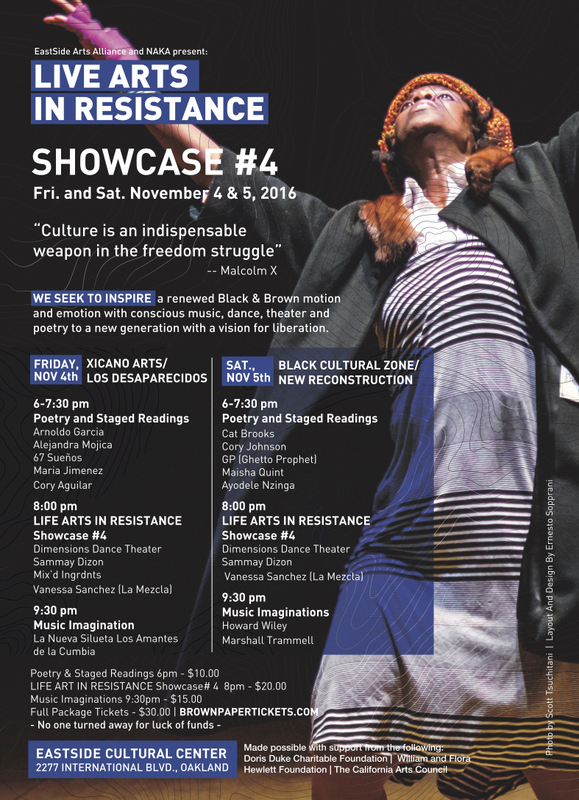 The Live Arts in Resistance series is supported by The Doris Duke Charitable Foundation; William & Flora Hewlett Foundation; The California Arts Council and the generous donations of individual supporters of EastSide Arts Alliance.